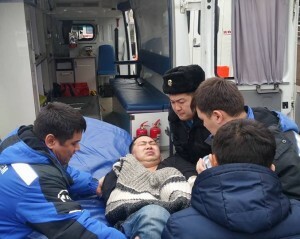 Activist Ermek Narymbaev in need of urgent medical assistance during the trial in his case. At the end of this week, early parliamentary elections will be held in Kazakhstan. These elections are taking place in an increasingly repressive climate for freedom of expression and pluralism of views. A new report published by Kazakhstan International Bureau for Human Rights and Rule of Law (KIBHR) and International Partnership for Human Rights (IPHR) documents recent key trends affecting freedom of expression, freedom of association and assembly and other fundamental rights in Kazakhstan ahead of the elections. The report is based on monitoring by KIBHR. The Kazakhstani authorities continue to stifle freedom of expression and open debate, in particular in the context of the ongoing economic crisis and the early parliamentary elections scheduled for 20 March 2016. There has been a series of recent arrests and criminal cases targeting journalists, civil society activists and other critical voices. It is of particular concern that broadly and vaguely worded Criminal Code provisions banning “inciting” social, national or other “discord”, as well as “deliberately spreading false information” have increasingly been used against individuals exercising their right to freedom of expression, including on social media. This has contributed to fostering a growing climate of intimidation and to suppressing discussion on social media. In a resolution adopted on 10 March 2016, the European Parliament denounced violations of freedom of expression in Kazakhstan, including in particular pressure on independent media outlets, as well as arrests and convictions of journalists, bloggers and other outspoken individuals. It called for a review of Criminal Code articles that “can be used to criminalise lawful behaviour protected by human rights law”. The office of the Nakanune.kz news portal, known for its criticism of authorities, and the homes of several of its journalists were searched in December 2015 and its editor Guzyal Baydalinova remains in pre-trial detention on charges on “deliberately spreading false information”. These charges have been initiated over an article on corruptions allegations, over which the portal already lost a massive defamation suit last year. In a development that has prompted widespread concern within the journalist community, Chair of the Union of Journalists and National Press Club Head Seytkazy Matayev and his son independent KazTAG News Agency Director Asset Matayev are under investigation on accusations of embezzling state funds and tax fraud. Matayev the older was arrested on 22 February 2016 and remains under house arrest. 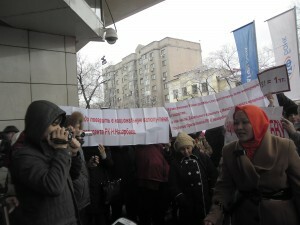 In one of the most notorious recent free speech cases, on 22 January 2016, activists Ermek Narymbaev and Serikzhan Mambetalin were convicted of “inciting national discord” and sentenced to two and three years in prison, respectively, and prohibited from engaging in public activities for five years. The two activists, who are known as vocal government opponents on social media, were charged over Facebook posts where they shared a supposedly offensive text posted elsewhere. Mambetalin was later released under an order not to leave Almaty and Narymbaev was transferred to house arrest pending the appeal hearing expected to take place at the end of March. Another activist, Bolatbek Blyalov was also convicted of “inciting discord” in late January 2016 and sentenced to three years of restricted freedom, during which time he will be subjected to limitations on his freedom of movement and participation in public activities. The charges against Blyalov concerned YouTube posts where he expressed his opinion on issues such as social problems and nationalism. The five-year sentence handed down to social media administrator Igor Sychev, who was charged with propagating “separatism” after sharing an online survey, was upheld on appeal in January 2016. Blogger Ermek Taychibekov was again given a four-year sentence on charges of “inciting national discord” in December 2015 because of controversial online writings expressing pro-Russian views. In January 2016, an appeal court cancelled the 1.5-year sentence of activist Amangeldy Batyrbekov, who was convicted of defamation last October because of an article criticizing the actions of a prosecutor. However, this decision was made on procedural grounds and he was not acquitted per se. The previous month another appeal court upheld the conviction of lawyer Bulat Baytyakov, who was sentenced to one year of restricted freedom last summer after his actions in court were deemed to have defamed a judge. The conviction of Seventh Day Adventist Yklas Kabduakasov on charges of “inciting religious discord” was also upheld on appeal in December 2015 and his sentence was increased to two years in prison. Kabduakasov was charged for sharing his faith with others. His case forms part of a pattern of harassment against members of so-called non-traditional religious minorities. In a rare not guilty verdict, on 29 February 2016, journalist Yulia Kozlova was acquitted of narcotics possession charges brought against her after police allegedly found a prohibited substance when searching her apartment. The judge also ordered an examination into serious flaws in the investigation of the case, which were revealed during the trial. While this was a welcome development, there are serious concerns that other journalists and activists have been convicted, although the proceedings against them have been marred by fair trial and due process violations. The trial against Ermek Narymbaev and Serikzhan Mambetalin was particularly egregious in this respect, as documented by KIBHR, and the trial went ahead in spite of urgent health issues of the defendants. Other individuals inconvenient to the authorities, including opposition party leader Vladimir Kozlov have been in prison for years after being convicted in unfair trials. The government Committee on Communications and Information closely monitors online content and warns and initiates measures to block websites featuring allegedly unlawful content. Under current legislation, access to sites can be fully blocked on such grounds following either a court decision or a request from the General Prosecutor’s office. Some websites have been blocked for prolonged periods of time without any official explanation. For example, the Ratel.kz and Zonakz.net news sites were inaccessible for several months until they became available again at the beginning of February 2016. The adoption of new rules for monitoring on- and offline publications of media outlets, as well as plans to introduce a compulsory national security certificate for internet users have given rise to concerns that the authorities may further step up internet control and censorship. New NGO legislation, which has been widely criticized for unduly restricting the freedom of association of NGOs, entered into force in mid-December 2015. NGOs have been given a deadline at the end of March 2016 to provide information for inclusion in a new database to be created under the law. Failure by NGOs to provide required or “correct” information for this database could result in that they are fined or suspended for three months. Many trade unions have experienced difficulties in re-registering in accordance with the requirements of the new Trade Union Law adopted in 2014. For example, the Confederation of Independent Trade Unions of Kazakhstan, as well as a new trade union of media employees were finally registered in February 2016 and December 2015, respectively, following lengthy processes involving the repeated resubmission of application documents. Other independent trade unions continue to operate without registration and the members of such unions have reportedly faced intimidation and pressure by employers to join state-controlled state union structures. Peaceful protest monitored by KIBHR. The right to freedom of peaceful assembly continues to be seriously restricted in the country, as highlighted by a new KIBHR report on the results of its countrywide monitoring in this area in 2015. Over 90 percent of a total of 71 peaceful protests monitored by KIBHR last year were held without the advance permission required by law, and about one third of them ended with dispersal and detentions of participants. The total number of protests decreased significantly from previous years and not a single political opposition rally was held, which can be attributed to the increasingly repressive climate in the country. This report has been prepared within the framework of the project “A Transnational Civil Society Coalition in Support of Fundamental Rights in Central Asia”, which is jointly implemented by KIBHR, Nota Bene, Turkmen Initiative for Human Rights and IPHR.